A labyrinth is a single path that has several 180 degree turns. This path leads the person walking it into the center and then back out again. 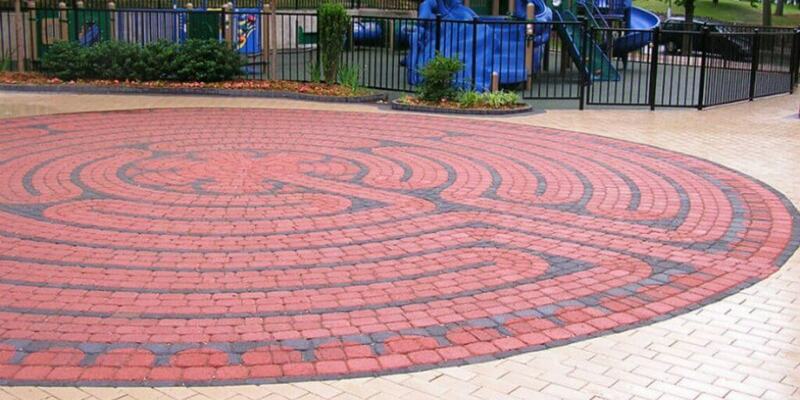 Walking the labyrinth is a spiritual practice that helps us set aside time to pay attention to God. Sometimes our lives seem like straight, easy paths and sometimes the twists and turns feel confusing or even exhilarating. Our design is an eight circuit “Vision Quest” designed by David Tolzman, and installed in 2005. The design is based on the medieval labyrinth in Chartres Cathedral in France. It is made of brick pavers and is located in our courtyard between the church education wing and the playground. 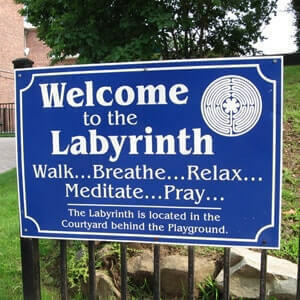 While people are welcome to come and walk the labyrinth at any time, it is located beside a preschool playground which gets heavy use during school hours. To learn when the courtyard is most likely to be quiet and peaceful, or surrounded by the sound of playing children, contact the church office. Sunday services during July and August are at 10:00 AM. During the remaining months, services are at 11:00 AM and people are always welcome to come join us for Worship and fellowship hour. You are welcome anytime on the weekend including before and after church.